What is Piercing Damage in Artifact? In Artifact’s combat phase, all units clash at once and deal physical damage to each other in order to settle their dispute. Armor reduces said physical damage to keep units alive longer. But what if you’re facing a hero or creep with so much armor that no physical damage is getting through? That’s where piercing damage helps out. Piercing damage goes right through armor and deducts damage straight from the target’s life points. So far the only cards with piercing damage that have been revealed have either been blue or black cards. The two that stand out in power both happen to be premier cards, and both are spells. Assassinate, Sniper’s premier, is a global target dealing heavy damage to a single unit. At the same cost Zeus’ Thunder God’s Wrath crosses all lanes for a powerful sweep. 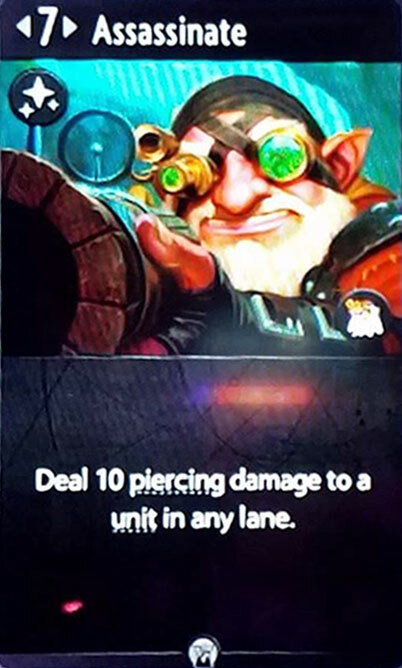 Piercing damage is the best possible counter to heroes and creeps that are tough to kill because of their armor. This primarily concerns red cards, but a couple of green cards work well with armor too. Use piercing damage to get rid of such cards when they’re getting out of reach of physical damage. When you’re trying to counter piercing damage, the best thing to do is keep your units as healthy as possible. Investing in armor is only useful when blocking physical damage keeps a unit out of range from piercing damage delivering a fatal blow. Consumables like Healing Salve and equipment like Fur-lined Mantle can keep your units alive long enough for them to remove the piercing damage dealing opponents.